The fashion world now has a glimpse of Virgil Abloh's eagerly awaited debut campaign for Louis Vuitton, channeling the same codes and values as the fashion house's spring/summer 2019 collection, presented in June. The campaign, shot by a line-up of renowned photographers, will come in three parts, each embodying its own side of this new summer collection. Unveiled last week, the first chapter—dubbed "Infancy, Childhood and Adolescence"—is themed on the different stages of child development and how they contribute to shaping each adult's unique personality. 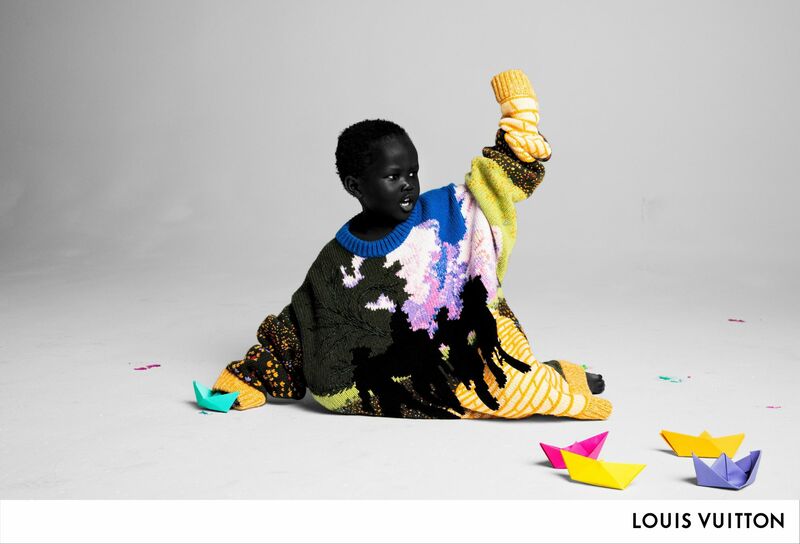 These initial pictures are shot by the duo Inez & Vinoodh and feature three-year-old Alieyth and two-year-old Jack, representing childhood in its most authentic form, as well as seven-year-old Leo James Davis, 12-year-old Evan Rosado, 15-year-old Prince Deboskie and 16-year-old Luke Prael, representing the pre-teen and teen stages. The second chapter, called "The Painter's Studio," after the Gustave Courbet painting of the same name, is shot by Mohamed Bourouissa and will be unveiled on February 1, 2019. Based on the 1855 artwork, the campaign shows Virgil Abloh alongside several members of his team, friends and models, wearing looks from the spring/summer 2019 collection. The final phase, called "School Teens," is scheduled to launch March 22, 2019, and will be the fruit of a collaboration with photographer Raimond Wouda. The shots, apparently representing communication between adolescents, will showcase a series of color-block T-shirts, nodding to Virgil Abloh's spring/summer 2019 show. Virgil Abloh stands out once again with this debut campaign, putting distinct values and notions in the spotlight to celebrate his latest collection.